One of first things I became aware of when I became a first time mother was what was in the tiny little diapers I was supposed to put on my tiny baby's bottom! What I learned about mainstream diapers scared me and it may have been just the thing that started me on my eco-journey! I no longer trusted products just because they were popular or what doctors "recommended"! 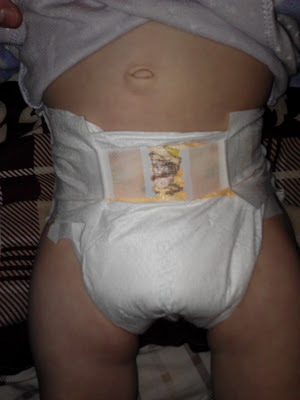 So the only thing covering my baby's bottoms these days are cloth diapers and when I am on the go or need to do laundry, I reach for one of my favorite eco-friendly and safe disposable diapers: Bambo Nature! Bambo Nature diapers are just like ordinary disposables, but they have a much lower eco footprint. Bambo Nature diapers are both ultra-thin and ultra-absorbent with a unique layer that draws wetness away from baby’s skin, keeping baby dry and comfortable even with repeat wetting. The nappies have been designed in conjunction with parents to assure the product has a practical design and are user friendly. Bambo Nature is available in 5 sizes to suit all ages – from birth until your child naturally achieves full continence. The Bambo Nature product line begins with Size 2 and continues with Sizes 3, 4, 4+, and 5. The wood used for pulp is derived from sustainable forestry; where more trees are planted than felled. There is absolutely zero chlorine used in the bleaching process. No chemicals or compounds from SVHC (REACH Article 33(2)) are used – Substances of Very High Concern. No known substances that are harmful to health or the environment. Phthalates Organotins (MBT, DBT, TBT) Heavy metals Chlorine (CI) Formaldehyde (HCHO) Colophonium AZO-pigments PVC Abena has gone as far as to prevent use of any chemical or compound that is known as locally irritating or sensitizing. There are no chemicals used during production. Abena has almost completely reduced all waste during manufacturing. Even powder and dust from the plant is filtered, collected and sold for further use. Bambo Nature is 80% biodegradable, more than 3 times as much as other brands. I definitely agree that Bambo Nature Baby Diapers are one of the very best disposable diapers in the world! There are only a few "safe" diaper brands out there but I don't know if any of them meet quite the standards that Bambo Nature does! Bambo Nature is certified free of “all” dangerous chemicals, not just chlorine-free. There are no phthalates, organotins (MBT, DBT, TBT), heavy metals, Cl (chlorine), HCHO (formaldehyde), colophonium, AZO-pigments, PVC, substances known as harmful to health or the environment, and any compounds listed on the SVHC (REACH Article 33)-a European Union List of Substances of Very High Concern. Bambo Nature is certified free of ALL known allergens or substances classified as locally irritating, sensitizing, carcinogenic, or mutagenic. But besides all their incredible natural and safe features, Bambo Nature diapers are just plain soft, highly absorbent, and completely breathable - features ALL parents look for! You definitely don't compromise health for quality with these diapers. These are some of the only diapers I can find that effectively absorbs my heavy wetters the entire night. And I have never had any leaky “blow outs” with these diapers! I also love that the size of the diaper is printed on the product (great when you have 2+ kids in diapers and don't want to get them mixed up!) and they have a wetness indicator. So I hope you can see why Bambo Nature diapers are definitely worthy of being featured this Earth Day! They celebrate Earth Day and our precious Earth EVERYDAY by the way they make their diapers and care about our precious children! Buy It: You can purchase Bambo Nature diapers from amazon.com, diapers.com, and bambonatureusa.com.